The first array of collectors for Genesis is assembled in Class 10 cleanroom. Scientists are chomping atthe bit for tomorrow's Earthly return of a sample capsule from NASA's Genesisspacecraft, hoping the star stuff it carries will help answer questions on theorigins of the solar system and we who live in it. After more than three yearsin space, the Genesis capsule has collected samples of solar wind blown fromthe Sun and is poised for a daring mid-air capture by a hook-laden helicopterabove the Utah desert Tuesday morning. If all goes well, thecapsule and its precious pieces of the Sun will be delivered into the waitingarms of mission scientists before lunch. "We have one parachutebetween us and being able to do what we want to do," said Don Burnett,Genesis principal investigator at the California Institute of Technology, in atelephone interview. "The mission starts when we get back on theground." Burnett, a researcher atthe California Institute of Technology in Pasadena, and other missionresearchers are eagerly looking forward to studying the composition of elementsand isotopes within the Genesis samples. Because the material came from theSun, they say, it represents the most pristine form of matter in the solarsystem since its formation. "What we've beenmissing is the starting point," said David Lindstrom, program scientistfor the Genesis mission at NASA headquarters in Washington D.C. "The first[goals] are to learn how the Sun and its family of planets originated anddetermine how the solar system evolved." The mission marks the firsttime in three decades NASA has returned space samples to Earth. Launched in July 2001, theGenesis spacecraft has spent the bulk of its time orbiting a region known asLagrange point, a point between the Earth and Sun where the gravitational pullfrom both objects balances out. For more than two yearsduring its flight, Genesis exposed a series of collector plates designed totrap solar wind particles that strike them. "We'll bring back afew micrograms embedded in these plates," said Bob Corwin, recoverysystems engineer for Lockheed Martin, which built the spacecraft. 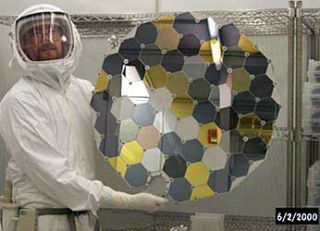 The collector plates aremade of extremely pure material, primarily silicone but also syntheticdiamonds, to make it easier for researchers to isolate the tiny particles of solarwind from their surroundings, Corwin added. Although Genesis isreturning a seemingly tiny amount of material, scientists expect to be drowningin solar samples. "We've got to think interms of atoms," Burnett said, adding that the micrograms of solar windcould contain billions of individual particles on the atomic level. "Soyou see, we have a lot to go around. Genesis researchers saidthe wind samples snatched by their spacecraft can be representative of thesolar system when it was still a solar nebula, a vast cloud of interstellar gasand dust 4.5 billion years ago before the Sun or planets formed. "All the matter in thesolar system, including us, was part of this vast cloud," Burnett said,adding that the nebula eventually coalesced into a whole range of differentplanetary material. "We want to understand how that happened." Until now, researchers havehad to rely on remote observations of stars using telescopes to study targetspectrums that then yield information on an object's composition. ThroughGenesis, however, astronomers expect a look at have an up close look at thatmaterial in their own lab. The research program isplanned through 2008. While researchers are eagerto get their hands on the Genesis samples, they are also looking forward tocompare their results with future space sample return efforts like NASA'sStardust mission. Stardust, which is bringback samples of the comet Wild 2 in 2006, will allow researchers to the chancenot only to compare solar wind particles with those from an icy body from thedepths of space, but also with Earth and lunar material as well. "Stardust and Genesisare brother and sister," Burnett said, adding that the two missions giveastronomers a peek at material from both ends of the solar system. "Ourplanetary knowledge is highly biased because we have sampled only things fromthe inner solar system...the Moon, Earth, Mars." Meanwhile, Genesisresearchers plan to hit the ground running. Once helicopters snag the Genesissample return capsule from the sky, it will be taken to makeshift clean room atMichael Army Air Field near Dugway Proving Ground in Utah. There, waitingresearchers check the container before sending it down to a dedicated cleanroom Johnson Space Center in Houston for further study. "With some luck, we'llhave something to report in six months," Burnett said.